I’ve been wanting to post this beautiful Mt. View Orchards wedding for a long time now and since it happened at the end of the 2015 season, let’s just say I’m a smidge behind. This event was truly life-giving to me and I loved everything about it, it helped incredibly that I photographed it entirely with film (no digital) and the couple was so kind. Paul and Erin had already been legally married for 8 years, but they had been married in a less-than romantic way on an uneventful day with no family or friends. Sometimes life (or a wedding) works that way. But after nearly a decade and 2 children later, they wanted to create a wedding event to say real-life, meaningful vows and to celebrate with a small gathering of their closest people about making it through the thick and thin and still being wonderfully crazy about each other. I adored that Paul and Erin chose exactly what they wanted in such a day–there was an immense amount of love, incredible food and drink, an amazing venue location, and wonderful people to surround them. For me, it was a great reminder that people get married in all sorts of ways and when couples remain true to themselves, all the other stuff is just that…. other stuff. This was the first real event at Mt. 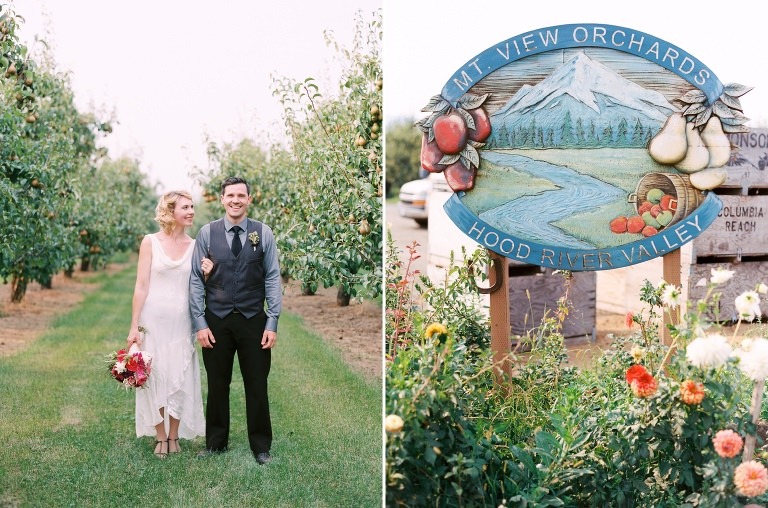 View Orchards, a newer event venue/working orchard in the Hood River Valley. 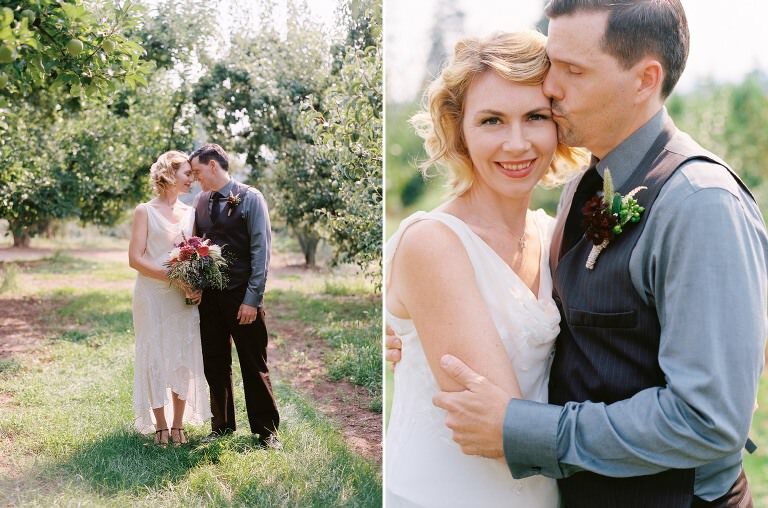 After this wedding, the farm broke ground on their now current Orchard Meadow and reception venue building. Paul + Erin had a much more rustic version of what Mt. View is today, but it worked so well with their casual event ambiance and rustic-meets-modern fruit and copper decor theme. Form + Line Design did a lovely job creating the arrangements on location that day and pulled real fruit and foliage from the orchard to create each design. The Lamb’s Table used an orchard-to-table concept with each dish created that day as well and the food was fantastically delicious! Truly, everything was marvelous. Peaches, apples, and pears from the farm were prolifically used throughout, from ceremony decorations to reception table runners, garnishes for cocktail hour hors d’oeuvres, and tasty additions to the signature cocktail. The colors of the fruits melded perfectly with the copper accents and furniture/decoration objects by Commonwealth Rentals. Through all the beautiful and delicious treats unfolding throughout the day, Paul and Erin were like giddy young lovers just drinking it all in and sharing it with those they love most. I’m so grateful to have been asked to document it for them, the day was such a dream. I’m also super thrilled to see some of the beauty of this day featured in and article for the 2017 Spring/Summer issue of Oregon Bride Magazine! All images created on film with a Contax 645, a Canon 35mm, and Kodak Portra 400 films.